The British and the sea have close connections. They invented the modern navy, not to mention the science of oceanography. Like us, they live on an island jutting out into an ocean. Like them, we ought to know a lot about the seas around us. In the decades after European settlement we were very much a maritime island, when Hobart fairly hummed with the coming and going of convict and supply ships, deep-sea whalers and coastal traders, but much of that early knowledge faded with air transport and the decline of our ports. Then along came the scientists. In 1978 the Australian Maritime College started up in Launceston. The 1980s saw the CSIRO Marine Division and the Institute of Antarctic and Southern Ocean Studies set up in Hobart, followed in the 1990s by the Antarctic Cooperative Research Centre and the Tasmanian Aquaculture and Fisheries Institute. These institutions are paying their way, helping us understand the workings of the sea and the life in it, how it’s been affected by human activity and how we might protect its ecosystems from decline or collapse. But they have their limits. Oceans are a very big, very complex subject to study. The hydrosphere (the watery part of our planet) is not only vastly bigger than the land areas in which we live, but also contains most of Earth’s life forms, perhaps as many as 30 million species. Compare that with the total number of land and sea species we’ve so far given names to, around 1.75 million. When it comes to learning about the sea around us, all these scientists and their institutions are, as the saying goes, just a drop in the ocean. They need help, and if the signs are right, they need it quickly. The oceanic environment is changing. Without the ocean waters absorbing around a quarter of the carbon dioxide in the air, our greenhouse warming would be much greater than it is now. But the oceans are reaching the limits of their capacity to hold carbon, which in the process is making them more acidic — only slightly, but enough to threaten extinction for some life forms. The sea is also getting warmer. Except for a few spots here and there, mainly in far southern waters, ocean temperatures have been steadily rising over the past 50 years. But seas close to Tasmania are warming at more than three times the global average — the fastest sea temperature rise anywhere in the southern hemisphere. A rising air temperature warms the oceans only very slowly, but changing ocean currents can bring rapid temperature shifts. Recent warming of waters east and northeast of Tasmania is mainly due to changes in a warm southward flow down Australia’s East Coast. Until recently the East Australia Current tended to peter out in eastern Bass Strait, but in the past few years it has extended its reach down Tasmania’s East Coast all the way round to Port Davey. In the process, it’s delivering a body blow to some of Tasmania’s most species-rich waters. New South Wales sea urchins are among the new arrivals that are eating out large kelp forests, leaving barren wastes behind. The cold-water Tasmanian rock lobster is facing competition from another mainland species, and warm-water algal blooms are happening where they’ve never been seen before. These swift changes have alarmed Tasmania’s marine science community. Dr Gretta Pecl, 2009 Fulbright Tasmania Scholar and a research fellow at the Tasmanian Aquaculture and Fisheries Institute, realised that observing and documenting the many species and habitat changes resulting from the warming marine environment was way beyond the capacity of the available scientists. Enter Redmap, the shorthand name for Dr Pecl’s brainchild, the “Range Extension Database and Mapping Project”. Redmap is a new interactive website aimed at engaging and educating the community about the effect of climate change on the Tasmanian marine environment. 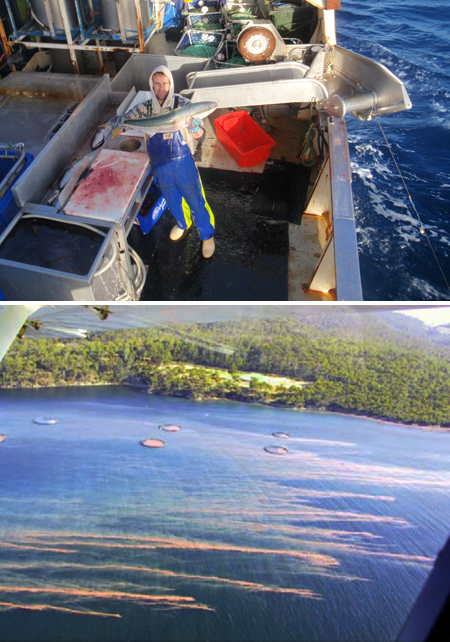 Redmap seeks to enlist the help of the 120,000 or so Tasmanians who catch fish from the sea, to record species not commonly found in Tasmanian waters and help map today’s changes to our coastal marine environment. It’s logical when you think about it. Fishing people, especially the professionals who spend so much of their lives on the water, have always been a rich source of information about Tasmania’s marine environment. As competitors in the fishing game they may not normally part with their knowledge, but Dr Pecl is expecting a good response for a cause that’s in everyone’s interest. The site provides an easy-to-use guide to the species from warmer climes that are now being found around Tasmania, along with a database to which users may add their own sightings, complete with a photograph if they have one. Records for each species can be viewed on a map. Redmap was launched last week by David Llewellyn, Minister for Primary Industries, Parks, Water and the Environment. You can find the site at www.redmap.org.au. This entry was posted in biodiversity, biological resources, carbon, carbon sequestration, changes to climate, climate system, economic activity, economic threat from climate, environmental degradation, local economy, marine organisms, ocean acidification, oceanography, science, Southern Ocean and tagged Antarctic Cooperative Research Centre, Australia, Australian Maritime College, biodiversity, biological resources, carbon, carbon sequestration, changes to climate, climate change, climate system, CSIRO Marine Division, David Llewellyn, East Australia Current, economic activity, economic threat from climate, environmental degradation, global warming, Great Britain, Gretta Pecl, IASOS, Institute of Antarctic and Southern Ocean Studies, local economy, marine organisms, ocean acidification, oceanography, Peter Boyer, Range Extension Database and Mapping Project, Redmap, science, Southern Ocean, Tasmania, Tasmanian Aquaculture and Fisheries Institute. Bookmark the permalink.